Spring is back, so the gelato is back. This address is not in the heart of the city but is worth a walk if you like your ice cream the Italian way! 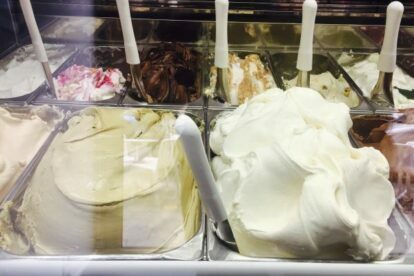 Herman, the owner of the business, worked in Italy to learn how gelato is properly made. He then came back to the beautiful city of Antwerp to start ‘Gelato Factory’ and it became an instant hit. It is so popular now, you will have to think about the time of your visit to avoid a queue. Or do it like me: order it by the liters. You can always choose from a selection of about 8 guaranteed flavours. The other 12 flavours (including sherbets) vary. Yoghurt is my number one choice, but is not in the permanent collection and thus is unfortunately not always available. If you like a special sensation, try out a flavour with honey from Antwerp. This is usually “Lavenda” or “Figues”. If you prefer a more fruity flavour, try “Kibana” which is a winning banana and kiwi combo. Whatever choice you make here, it’s of guaranteed, hand-made quality.